This is a great bedside companion book. 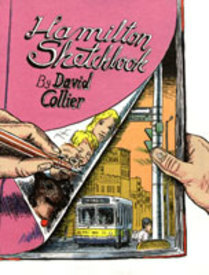 In it, long suffering Canadian comics artist, David Collier shares his life in a trailblazing hybrid of words and images, primarily in the form of journal entries and sketches. This is among the most intimate forms of expression and pushes the McCloudian definition of comics into the realm of artists' sketchbooks. It is a relaxing and enjoyable read, full of interesting anecdotes, witty observations and self-deprecating humor, and, of course, great pen and ink sketches of life as it is lived today in Canada.